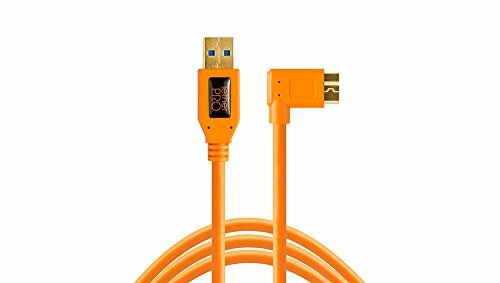 TetherPro 15 foot(4.6m) SuperSpeed USB 3.0 Male A to Micro B Right Angle Cable is the latest technology available for the fastest and most reliable transfers. To meet the needs of various photographers shooting styles, TetherPro has designed a right angle cable that routes down compatible cameras. Depending on one's shooting style, having a cable coming straight out of the camera may cause interference. Additionally, using an "L" bracket on the camera often interferes with the cable coming out of the port. The TetherPro angled cable is designed to extend down the side of the camera allowing cables to be used during shoots and adapt to one's shooting style and needs. TetherPro SuperSpeed USB 3.0 cables incorporate all of the latest technology ensuring consistent and reliable conductivity. Designed to the highest USB specifications to filter out signal noise and reduce transmission errors, all cables are fully shielded to protect against external signal interference. The 15 foot(4.6m) USB 3.0 cable connects to the camera using the micro B connector to ensure delivery of excellent performance. High Visibility Orange Cable Included (also available in Black). Please note: Many USB 3.0 camera owners are experiencing dropped tethering connections or are unable to get a tethered connection started at all. The core issue is that computer manufacturers, mostly in an attempt to be as efficient with power as possible, are either under powering or dynamically powering their USB 3.0 ports. For a solution to this problem, please check out the TetherBoost Core Controller. SuperSpeed USB 3.0 has a 5 Gbps signaling rate offering up to 10x performance ncrease over USB 2.0. Backward compatible with USB 2.0. Devices inter-operate with USB 2.0 platform.